**** ABOUT THE ABOVE NAQSH: This is the Naqsh of the whole body. The round portion on the top is for head. There the Name Hu (Ism e Hu) and the Name Muhammad (Sal Allahu Alaihe Wa Aa-lehee Wa-sallam) has to be inscribed and the Kalimah-e-Tayyeb ? has to be written (through Visualization). The strip below the top is for the bosom. From this Naqsh, the Key and password for the solution of problems is found; freedom against the Waswaas of the Khannas and Khartoum and the illusions and Khatraat is won; and the Nafs and Satan get separated. The true and real Zikr comes in the Share and the veils over the Kaamil Divine Theological knowledge (Ilm-e-Ludunni) are lifted. The lowermost section is for the navel. 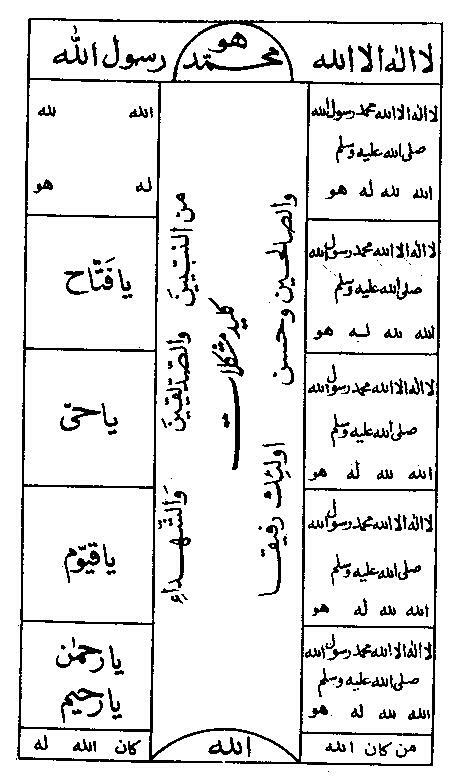 Here the Name Allah has to be written (through Visualization). Nafs dies due to this. The both sides of the Naqsh are for the both sides of left and right flanks of the body. The respective Names that have to be inscribed and written there have been mentioned in sequence. If one cannot perform this, he should make a copy of this Naqsh on a blank sheet of paper, and put it in front of him and focus his eyesight on it and stare it with full careful attention. Make sure that the eyes should not blink while doing this (Explanation by Dr. K. B. Naseem Rh. ).